Serenity. Tranquility. Solitude. Our safari tours into Central Kalahari, the Makgadikdadi Pans and Tuli Game Reserve offer you an escape into a pristine and remote semi-desert landscape. Enjoy the comforts of an excellent lodge, an opportunity to discover a different world and a moment where you can truly experience the stillness of Time. The real attraction of the Kalahari lies within the environment itself. A remote area, barely touched by human habitation, which presents a rejuvenating nature experience in 900, 000 square kilometres of nothing, and a place where you can experience oneness with the universe. The Kalahari stretches across much of southern and central Africa. 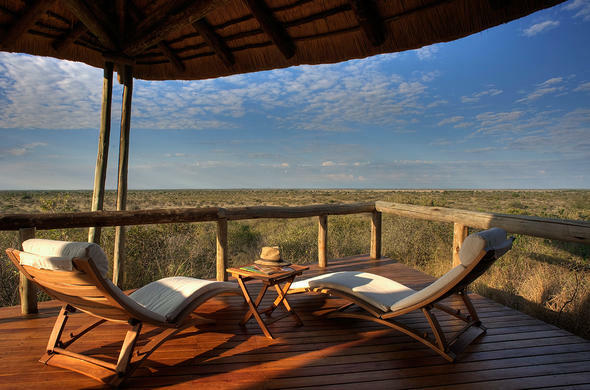 It is a place where true 'openness' prevails and where the sky unfolds with featureless horizons in the distance, a place where you can hear absolute silence during the night between the distant roars of a Kalahari lion. 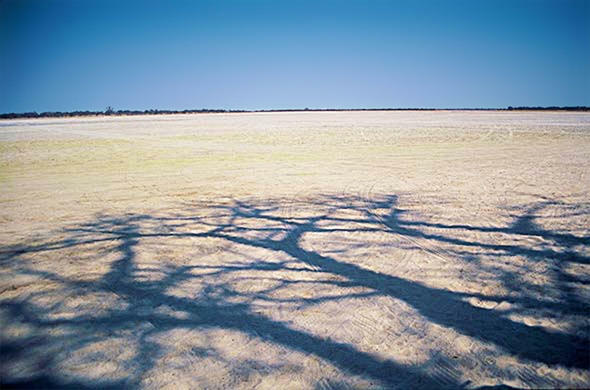 The Kalahari is only semi-arid, and is not a true desert. The weather is extreme, with very dry and cold winters. While the summer months are very hot and wet. It is the kind of place that will not be the same as your previous visit. Seasonal migrations bring their own dramas and the best time to visit Central Kalahari is during the changing of the seasons. And, with any of our Makgadikagadi Pans safari tours you are presented with several opportunities to discover unique facets of the Pans whilst staying in very unique and comfortable camps. The diversity and eco-systems of the Kalahari Pans seems never ending: rolling grass dunes, valleys of ancient rivers and the vast, flat clay or salt pans. The Kalahari's rich diversity and roots in ancient civilisation, redefine the wildlife experience. Predators abound, with Black-backed Jackals (pictured left, Lions, Leopards, and Cheetahs commonly encountered. The lack of surface water means that predators must get their liquid requirements from the prey they hunt. 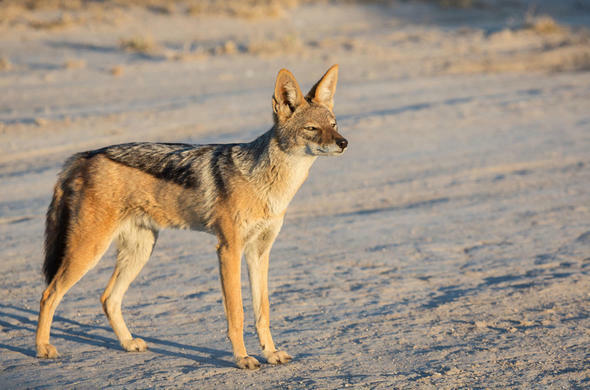 Central Kalahari wildlife has adapted to the challenging desert environment in interesting ways so as to conserve water and energy, exemplifying the remarkable tenacity of the life of the region. Animals such as the oryx have adapted to the lack of water in the Kalahari by developing physiological mechanism of controlling water loss, and springbok have found their own unique method of survival. 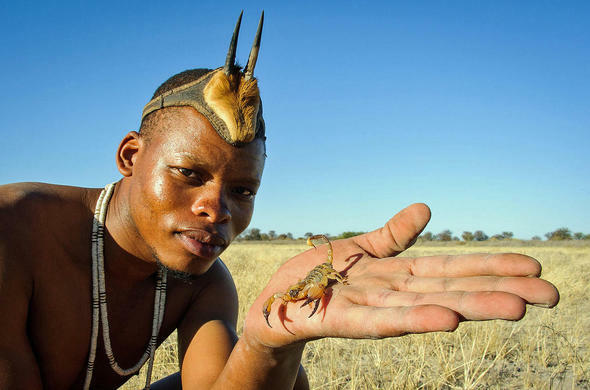 Enter the ancient mythology of the San bushmen of the Kalahari. 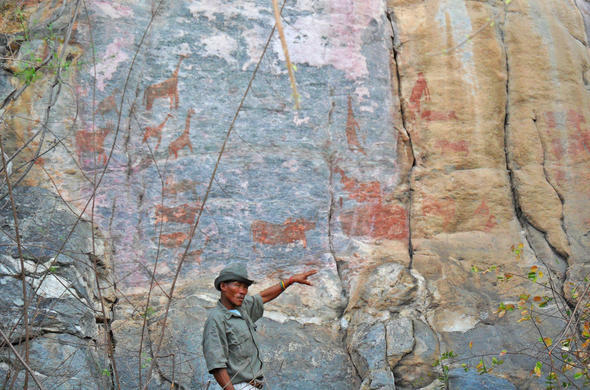 Voyage back some 20 000 years as you come face to face with the over 4,500 rock paintings of Tsodilo Hills. The only wildlife in this area is the ancient images you see depicted upon the rocks. A rare insight into an ancient art form at this this one-of-a-kind UNESCO Heritage Site. 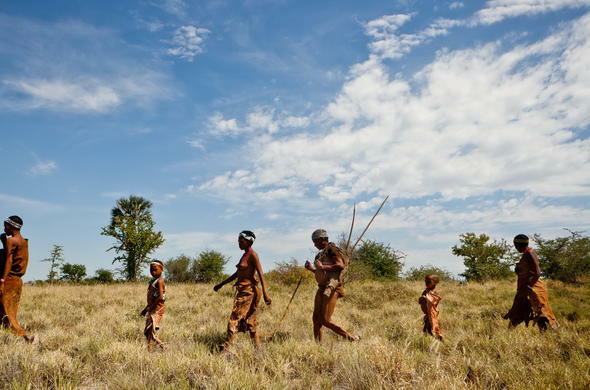 The Central Kalahari's wilderness, wide open spaces and intense solitude are set aside for the San Bushman people and today is one of the largest protected areas in Africa.